This unit is our top-of-the-line with the more attractive effect, even larger boxing than the Small-Box Eve unit. 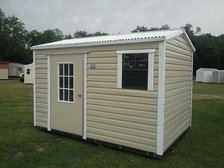 This unit is available in both wood-stud and steel-stud frames with our aluminum-framed door standard with your option of choosing the mobile-home type door or rollup door. Available in sizes from 6x10 up to 12x30. 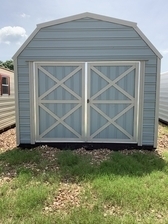 We refer to this unit as our turnaround unit due to the longer gable end in proportion to the shorter length of the sidewalls. This unit is available in our standard New-Type Eve, Small-Box Eve or the Big-Box Eve. It is available in either wood-stud or steel-stud framing. 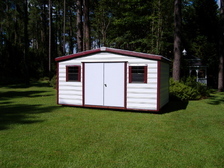 As with all of our sheds, you may choose the type door you prefer. Available in sizes 8x6 up to 30x12. 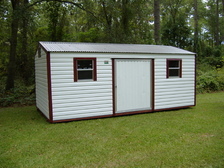 This unit can be built to your specs in height and slant the roof in any one direction. 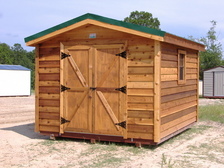 It is offered in steel or wood construction. Perfect to be set beside an existing building or wall. Available in sizes from 6x8 up to 12x30. This unit is constructed with a heavy-duty truss system to support its extra size. 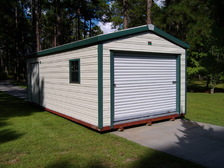 Mainly used for carports or small workshops, this unit is versatile and economically priced for its size. 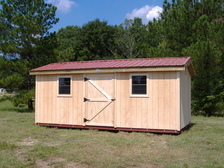 The lofted barn style building is available in a wide variety of colors for both the sides and the roof. Available door options are 4'ft and 5'ft wide single swing doors, double doors and garage doors. The number of windows, electrical lights, and receptacles depends on the size of the building ordered. 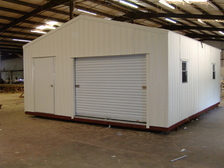 Available in different sizes and colors, this unit is usually custom designed for each customer's individual needs. 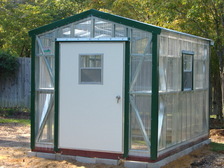 A variety of different sized doors and windows available upon request. 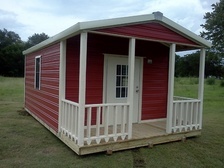 As you can see below, our playhouses are portable like our other units. 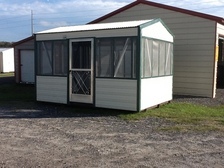 These units are standard with a small porch with the size of the porch usually specified by each customer. 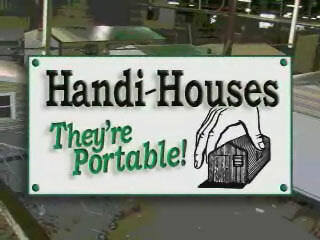 We can build with short walls like a doll-house or with standard height walls for a backyard getaway.